The General screen is where you can customize the appearance and functionality of your website. 1. From the Admin tab, click the Site Settings sub tab on the left-hand side of the screen. The screen will initially display the General tab. HTML Head Title - The title you enter in this field will appear in the upper left-hand corner of your internet browser Title Bar, as shown below. Site Title - The title you enter here is what will appear on your browser screen. Site Subtitle - If you wish to have a smaller sub-title appear beneath your site title, enter it here. Language - It is recommended that you do not change the Language field. Site Template - This field determines the theme of your site. You will have access to more templates as they become available. 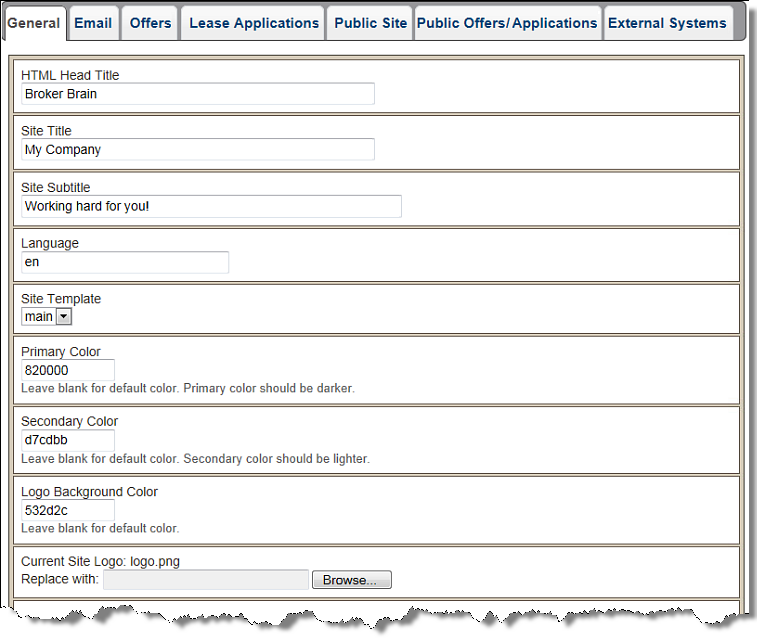 Primary Color, Secondary Color, Logo Background Color - These fields allow you to customize the colors within your Broker Brain system as shown in the screen shot below. For instructions on how to change your screen colors, click here. 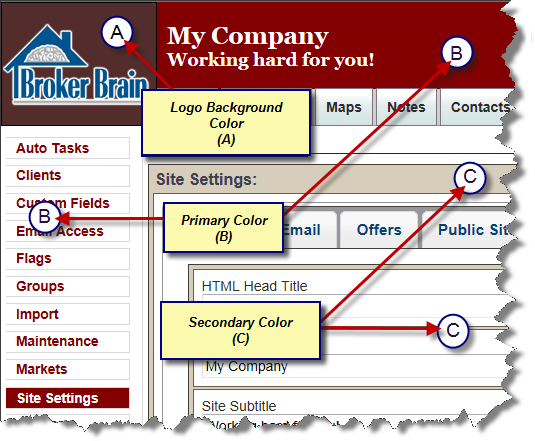 Current Site Logo: logo.png - You can replace the Broker Brain logo with your company logo or another picture by changing the information in this field. Time Zone - Here you can change the time zone for your location. To verify the date and time are correct, click the green Check button. This information is used for the time stamps of notes, status changes, etc. Text Mode - Options in this field include Plain Text and HTML. Choosing HTML will allow for more formatting options in the emails sent from within Broker Brain as well as in the notes that you create. Photo Size - All photos uploaded into Broker Brain will be resized to the dimensions you indicate in this field. This keeps photos consistent within the system and scales large photos to a reasonable size. 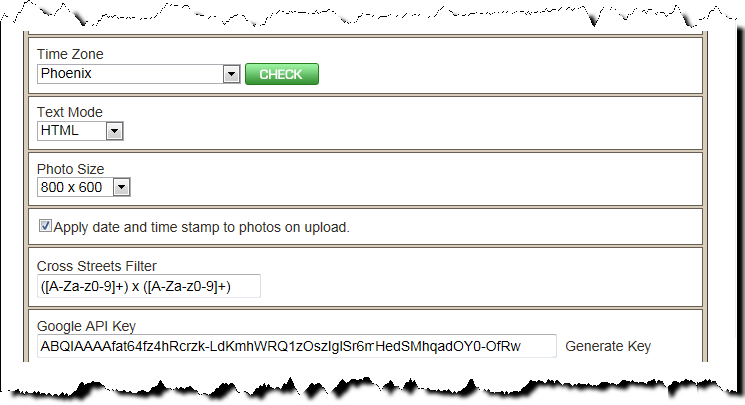 Apply date and time stamp to photos on upload - When enabled, this feature will automatically apply date and time stamps to photos when they are uploaded. The dates and times are accurate for when photos were taken, rather than when they were uploaded. Cross Streets Filter - This field allows you to determine how cross streets should be entered into this system. The default filter allows for street x street to be entered. If you would like to enter cross streets into the system in a different way, send an email describing how you would like cross streets to be entered to support@brokerbrain.net. We will send you a new filter that you can place in this field. Google API Key - It is recommended that you do not change this field. Show County in property info - When this box is checked, county names will be displayed with property addresses wherever they appear on both your public and private site. The only users who can access all properties are those set up as Property Agents Power Users or Property Assign Agents Power Users. 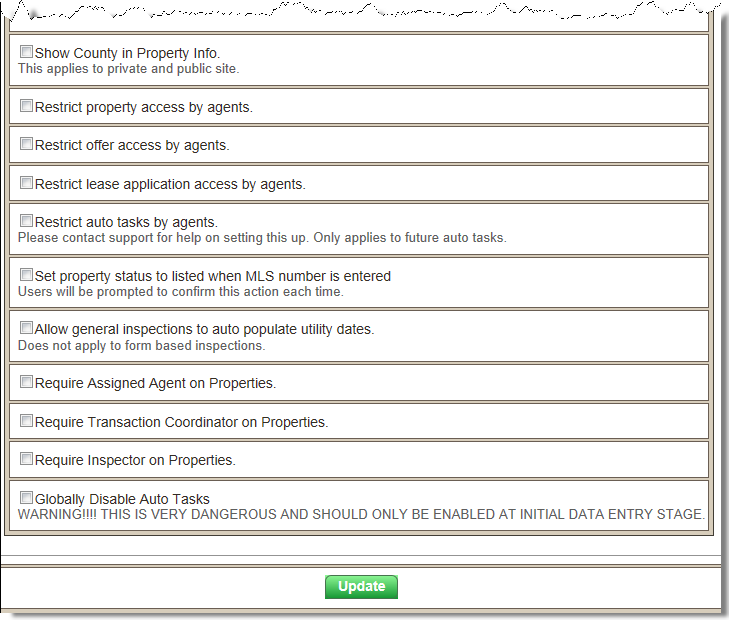 Properties that are not assigned to an agent will continue to display for all users. Restrict offer access by agents – By selecting this option, Broker Brain will only show property offers to the assigned agent or to users assigned to that agent's group. If you enable this feature, only Offer Agents Power Users will be able to see offers on all properties. Restrict lease application access by agents – By selecting this option, Broker Brain will only show lease applications to the assigned agent or to users assigned to that agent's group. If you enable this feature, only Lease Application Agents Power Users will be able to see lease applications on all properties. Restrict auto tasks by agents – Contact support for more information and to set this up. Set property status to listed when MLS number is entered – When this option is chosen, any property for which an MLS number is entered will automatically be set to listed status. You will be prompted each time you enter an MLS number into a property to confirm this option. Allow general inspections to auto populate utility dates - When this feature is enabled, property utilities confirmed on and turn off dates will auto populate when an inspector designates an on/off status using the General Inspections screen. Require Assigned Agent on Properties - Enabling this feature will require that an Assigned Agent be designated when a new property is added into Broker Brain. Require Transaction Coordinator on Properties - Enabling this feature will require that a Transaction Coordinator be designated when a new property is added into Broker Brain. Require Inspector on Properties - Enabling this feature will require that an Inspector be designated when a new property is added into Broker Brain. Globally Disable Auto Tasks – By checking this box you will disable the assignment of Auto Tasks. You will likely want to do this during system roll out, when you are importing properties. Be sure to uncheck this to enable Auto Tasks after you have imported all of your properties.